Photo of Tudor Cottages included in this Sale Document. 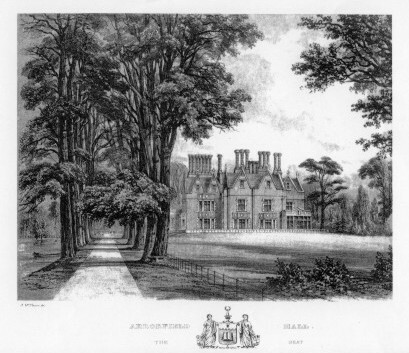 The Auction Sale document of the Arborfield Hall Estate dating from August 18th 1855 was held in central London, and was successfully sold to John Hargreaves. After the image of the front page and picture shown below is most of the text contained in the Sale document. A particularly healthy, beautiful, and favourite Neighbourhood, within reach of Four Packs of Hounds, and only One Hour and a Half's Journey from London. at twelve o'Clock (unless privately disposed of by Private Treaty). About 5 Miles Southward of the capital TOWN OF READING. It is on the borders of HAMPSHIRE, within easy distances of STRATHFIELDSAYE and WOKINGHAM. In the midst of a most desirable Neighbourhood, the Country being well studded with Gentlemen's Seats, and intersected by picturesque Drives. The Great Western Railway Station at Reading affords communication with Bath, Bristol, Gloucester, and South Wales, with Branch Lines connecting it also with the Windsor, Southampton, Brighton, and Dover Railways; and the New Line now under construction from Staines by Ascot Heath to Wokingham, which latter Town is only about 3½ miles distant, will give ready access to all parts of the Kingdom. in which it has the full right of fishery. AN ELEGANT AND MOST CAPITAL ELIZABETHAN MANSION. and near the church is a beautiful little wood of about five acres, stored with young thriving oaks, and through which are wild shaded walks. Is a very substantial Edition, of solid Brickwork, with Stone Dressings, in Foundations and walls of unusual strength. It is of the olden English style of Architecture, chiefly of the Elizabethan order, with Gables, Oriel Windows, and Ornamental Roads and Chimneys. It presents a strikingly handsome exterior. skirting (but much above) the bank of the river for a considerable extent, a shaded on each side by majestic firs and limes, forming a noble avenue. The Mansion is in the most perfect and beautiful order, the Rooms particularly cheerful, and the Decorations in admirable taste, evidently executed without regard to expense; the principal Window Frames, Doors, Staircase, and many of the Floors, of Polished Oak. It contains, on the upper floor, the Clock Tower: Nine cheerful Bed Rooms (one Suite planned for Nurseries); a Work Room; Linen and Housemaids' Closet; Hot and Cold Water Pipes, and Water Closet; wide Landings, with enclosed Stone Staircase. On the First Floor, five best Bed Rooms ( 3 large, and with Bow or Oriel Windows overlooking the Park and River), and 3 large Dressing Rooms, They open upon a spacious light Corridor, its Windows ornamented with embossed Glass. These Rooms are all furnished, as to Chimney Pieces, Papering, Mouldings, and other decorations, in a tasteful and expensive manner; and in some are convenient modern Wardrobe Presses, and other Fittings. The Stone Staircase from the Servants' Apartments has a communication with (but shut out from) this Floor also. The Principal Staircase is of polished Oak, broad and handsome, and lighted by a richly painted Window; the Ceiling panelled. The Ground Floor consists of an elegant Drawing Room, about 51 Feet long, its length relieved by four deep Recess or Bay Windows, looking over a Terraced Court to the Park, with Steps leading to the River Bank. It is finished with a most costly and beautifully Sculptured Statuary Marble chimney, rich Gold Paper and Mouldings. A large Morning Room, now used as a Bed Room; a Water Closet; a Bath Room; a handsome Library, about 24 Feet by 15 Feet, exclusive of Window Recesses; a small Cabinet Ante Room; and Billiard Room, about 24 Feet by 18 Feet, overlooking the Back Lawn and the River. A noble Dining Room, with spacious Bow, about 30 Feet by 18 Feet. It is finished with costly Marble Chimney, Green and Gold Papering, and Panelled Ceiling. The Reception Rooms are all light and cheerful, and are connected by a warm, handsome broad Inner Hall and corridor, with Vestibule and Porch to the carriage approach. are of a very superior description, and most judiciously arranged. They are nearly surrounded by an Area, and have Hot-water Apparatus in the Passages, rendering them particularly dry and healthy. They consist of a large Housekeeper's Room, with Store Room adjoining; a Butler's Pantry, with Water laid on, and fitted with a large Fireproof Iron Plate Closet, and a smaller one over the Fireplace; Butler's Sitting Room and Bed Room; Men Servants' Bed Room; Housemaids' Closets; Store room; Ale cellar; Wine Do. with 26 Bins; Beer cellars; a Range of enclosed Bottle Racks; Knife and Lamp Rooms; and a Bath and Water Closet for Servants; Footmen's Bed Room (f r 2 or 3 Beds); Servants' Hall; a capital Kitchen, completely and expensively fitted up with Steam Apparatus and Stewing Stoves, marble Dresser, &c., with a large Scullery and all amply supplied with River and Rain Water; Bricked Coal Bins under cover for the Kitchen, and outer Depots for Wood and Coals; a Larder, fitted with Marble Slab Dressers; Dairy, and Churn House, with Water laid on, and Bakehouse; and a large bed Room above for Dairymaids. The Offices open to a neat Paved Yard, in which is the Engine House, Water Closet, &c., and are approached by a concealed Carriage way under an Archway of the Office Wing. The whole of the Premises and Offices, &c. are in perfect Order and repair. On the Bank of the River, close to the Flower Garden, is an ancient Pavilion Building, partly covered with ivy, &c. It contains a Sitting Room, and one below appropriated for light Boat Gear, Fishing Tackle, Archery Stores, &c., under which is the Boat Bay. Intermixed with the Pleasure Grounds are Parterres and Clumps of Flowers, Plants, and Shrubs, Sculptured stone Fountain, a handsome Conservatory, &c.
The Vegetable Gardens are enclosed by Lofty Walls, clothed with the choicest Fruit Trees - the greater number now in their prime. There is a Vinery and Plant House in the Gardens, and about 124 feet of the fruit walling enclosed glazed frames, forming an extensive and lofty hothouse for various fruits. There is a Melon Ground, with Melon and other Forcing Pits, Water Cisterns, and Pumps; Fruit and Sand Room, Tool Sheds &c., and Two Rooms for the use of the Gardeners - the other part of the Cottage being shut and near the Mill, consisting of three or four Rooms for Labourers. This valuable Property is situated on the bank of the River, north-westward of the Farm Homestead, in a picturesque secluded spot, perfectly screened from the Mansion. It comprises a most comfortable Residence, placed on a Grass Bank of the River, which flows through its Gardens and Pleasure Grounds; and it opens backward to a Rich Meadow, No. 14, with a fine view of the country towards Reading. There are excellent Gardens and Ornamental Grounds in front of the House, which contains 3 Attics and a Lumber Room, 5 Bed Rooms and a dressing Room, and Water Closet, Front and Back Staircase, Hall, Dining and drawing Room, and Study or Breakfast Room, good Kitchen, Washhouse with excellent water, Dairy, Pantry, and cellars. Back Yard, with Wood, Coal, and Knife Houses, &c.
On the opposite side of the Garden are a small Cottage and Cow House, Stabling for 4 Horses, Harness Room, and Lofts. The Mill is exclusively established as a Factory of Brown Paper, inroducing nothing offensive; and the whole process is carried on in a remarkably neat clean manner. The Buildings are very spacious, but remarkable light and neat; comprising an Engine and Machine Room, Vat, Store and Hemp Rooms, large Drying Rooms, and finishing Salle or Hall, with large Press and Packing Rooms. The whole are in excellent repair. The large Water Wheel belongs to the Estate, but the Engines and Machinery, and other fittings, to the Lessees, Mr. Toogood - a most respectable tenant, who holds the Residence and Premises under a Lease, of which 6 years are unexpired at Lady-day, 1854, at the low rent of £200, with the option to the Tenant to hold one additional year for the purpose of removal, if no new arrangement is completed. may be considered Models for farms; they are at the back of the Stable Yards and Gardens, perfectly detached, at a considerable distance and perfectly screened from the Mansion. The First Stock Yard is completely enclosed by its Buildings, consisting of a range of Fatting Lodges, with Hay and root Houses; capital Strong Piggeries, both for Store and Breeding, with Wash Cisterns; a Granary; Meal and Slaughter House; Meal Store, &c.; and in the centre of the Yard a Covered Sheep House, on Strong Pillars, about 54 Feet square, divided into 5 Pens, capable of Fatting 240 Sheep, with open rail and floors and Manure Pit below. is enclosed by a double Range of Bullock Lodges, Hay and Root Houses, raised Hog Pens, and separate Pig Yard, with Troughs, &c.
There are altogether Stalls for 38 Beasts, and Calves' Pens, with good pitched standing, and fitted with Troughs for Food and Water. the Yards have stoned causeways next the Buildings, which are all well drained, and planned for the economy of labour, and against all waste of Food and Manure. On which a vast sum has been expended in Substantial Buildings, and Improved Machinery for expediting and economising the operations for marketing the produce of the lands, for the reception of which they are judiciously placed. the Buildings comprise a Rest or Dinner Room for the Farm Servants; a Shed, with Weighing Machine for Coals, cattle &c.; a Bailiff's Office; Implement Sheds; Capital Stabling for 11 or 12 Horses, with Harness Room; Corn and Chaff Bins, &c.; a long spacious Shed for Straw or Cattle; and an extensive Barn divided into Grinding, Threshing, Dressing, Chaff-cutting, Pulse-splitting, &c., completed by a Steam-engine of 10-horse power; the whole in perfect order and repair. In the Rear is a small Granary, Cart Shed, and a large Implement Shed, and a range of Poultry Houses; and on the side, a long 9-bay Cart Lodge. About 80 Acres the North-east side of the Farm are in Hurst Parish. containing Six Rooms, Pantry, Pumps, &c. Also, in No. 19, on the South-east side, Three Model Ditto, each containing Four Rooms, with Gardens, Wood houses, Pumps, &c.
The rural little Church is at the verge of the Park, partially screened by Shaded and Ornamental Plantations and Shrubberies. The greater part of the side Aisle, which belongs to the Estate, will be consigned for the use of the mansion. 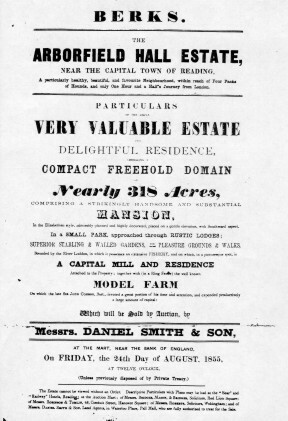 About 56 Acres of additional Meadow and Arable, in the Parish of Shinfield, North-westward of the River, are held by Lease for 9 years from Michaelmas next, determinable by the Lessee at Michaelmas, 1856; and it is probable, if a larger extent is desired, that they may now be purchased. All the expensive and costly Marble Chimney Pieces, Pumps and Cisterns, Water Closets, Pipes, Bars, Locks and Keys, and other Fastenings - also all Hot Houses and Conservatories, melon Pits, and fixed permanent Iron Fences - will be included with the Freehold. The Steam Engine and various Patent and other Machines and Machinery may be taken to at a fair Valuation, or the Vendor reserves the right of selling and removing the same. I, John Hargreaves of Broad Oak, Accrington, Lancashire, Esquire do hereby acknowledge that I have this day purchased by private treaty the estate described in these particulars at (?) for the sum of Thirty two thousand pounds including all the fixtures, steam engine and apparatus, timber plantations - and having paid into the hands of Messrs. Daniel Smith & Son the sum of one thousand five hundred pounds as a deposit in part payment of the said purchase money. I hereby bind myself, my heirs, executors and administrator to pay the balance of the said purchase money and to complete the said purchase in all other respects agreeable to the above conditions of sale. As agent of the Vendor, we hereby confirm the sale on the above conditions, and acknowledge to have received the said deposit.